When it comes to managing the revenue generated by the business, having a high quality cash drawer is an add on. As there are a bunch of models available in the market, choosing among tons of options is a daunting task. Traditional ‘ka-ching’ models are attached to the billing register and they open automatically when a sale is billed. However, with wireless connectivity, tablet and smart phone billing, and cloud-based billing systems, the traditional cash drawer has evolved into a standalone cash drawer that can be placed anywhere on the counter or underneath it. There are so many different varieties available, choosing just one can be difficult. Nonetheless, certain features are essential in a cash drawer and this guide will help you evaluate and choose one model based on these features. Traditionally, most versions of a POS (Point of sale) cash drawer looked the same, with the same design and features. Times have changed though and you can choose from different sizes, shapes and colors. Modern-day cash drawers are simple in design with clear spaces for currency, coins and accessories. You can also customize the interior with special inserts colored in unique ones to help cashiers collect money easily. Most versions are colored black, grey or brown, but you can easily request custom-colored cash drawers to suit your store decor. You should know that almost all standalone cash drawers are quite affordable and may cost anywhere from $50 to about $400 per unit. If you are buying a traditional till and cash drawer, the drawer is integrated in to the till and the cost is all-inclusive. However, modern-day point of sale systems have standalone drawers that respond to signals from the POS software. As a result, the cash drawer hardware should be compatible with the software. For this reason, make sure you choose your equipment from the vendor who is providing you with POS. This is essential as hardware and software is usually provided as a package deal to ensure compatibility. Not only do you get a larger variety to choose from but you will also get a better rate due to the bulk purchase. To ensure that you get the best deal, it is a good idea to buy hardware and software from a good POS vendor and you will get the best rate. Standard sized models are fine for an ordinary business. These drawers open and close manually or electronically and have manual and automatic locks. Standard duty drawers are also tested for as much as one million transactions annually and they are covered with a two-year warranty. Larger and smaller models are also available but most retail stores prefer to use standard 280x400x110 sized drawers. For high-traffic stores that deal with cash, some systems also offer double-layered cash drawers to store cash, coupons, bills and receipts. In case you don’t have a lot of cash transactions, shallow or low-depth pressure locked drawers are also available. All POS cash drawers offered by companies such as Shopify are provided with a manual key lock. Along with key locks, some versions also have pressure locks. When a transaction is complete, the POS system automatically unlocks the cash drawer and it springs open. The cash drawer opens by sending an electromagnetic signal through a device called a solenoid. The cashier then swings the drawer shut when the cash is collected. However, a manual lock is also provided to secure drawer contents overnight. When the manual lock is engaged, even the POS system cannot open the drawer and this ensures that the store’s cash collection remains safe. 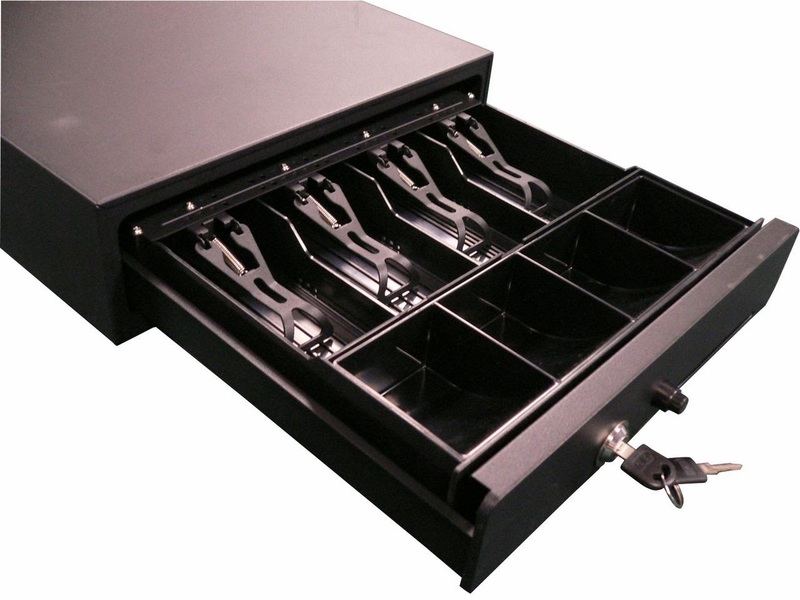 Apart from these locking systems, some cash drawers are also provided with lockable covers that cover the drawer even if the drawer is opened. These clear covers allow the cashier to look into the drawer contents but they cannot access the contents unless the drawer is unlocked. Other safety features built into the drawer include steel ball bearing slides, long-lasting designs, powder-coated finishes, etc. Every store has unique requirements. To enable personalization, vendors make variable drawer inserts that you can select for your store requirements. For example, most stores prefer inserts with 4 – 6 banknote compartments, 1 – 2 vouchers or coin roll compartments and removable variable inserts for additional paperwork. You can also choose a drawer that is placed on the counter or underneath the counter, large, small or medium sized and one-tier or two-tier depending on requirements. A cash drawer is required if you plan to accept cash but there are many options to choose from and you can easily find a model to suit your requirements. No matter which model you choose, all vendors provide 2-5 year warranties and this can be quite useful for store owners. Just make sure that you evaluate these above-mentioned factors before you proceed and you should find the perfect cash drawer for your store.